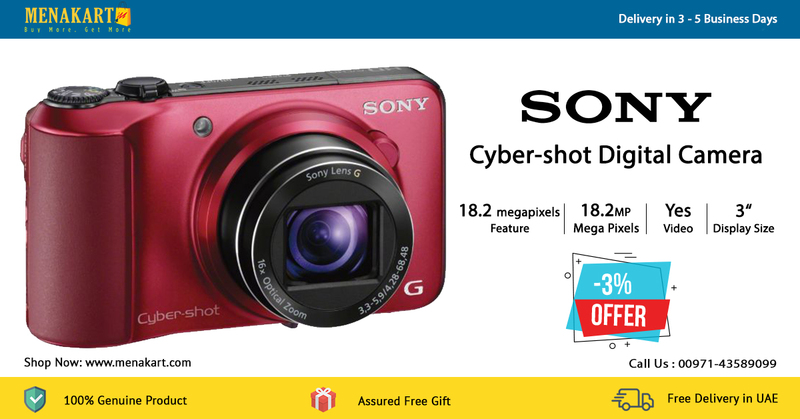 Capture the moment with this handy Cyber-shot HX10V camera, and make memories to treasure forever. User-friendly features - like 16X optical/32X Clear Image zoom, 18.2MP Exmor R CMOS sensor, high speed AF, 10 frames per second and Full HD video capture - make it easy to shoot high-quality photos and videos to share with friends or post to your profile. Super-fast, DSLR-like focusing speeds deliver amazing results that take full advantage of the camera's sharp Sony G lens, even in low light. Use dual record to shoot Full HD 1080/60p video while simultaneously capturing stunning still images. Optical SteadyShot image stabilization with Active Mode helps eliminate camera shake for blur-free movies even while walking. Add an all-new dimension of wonder to your creations with 3D Still Image and 3D Sweep Panorama mode. View it all in crystal clarity on the 3.0" Xtra Fine LCD (921K dots). Sony's warranty requires the consumer to contact Sony directly with any issues about this product. Capture every moment and its GPS location automatically with the Sony DSC-HX10V. It's 16x optical/32x Clear Image zoom gets you closer for detailed 18.2 MP pictures, while optical stabilization provides for smooth Full HD videos and high speed AF. Enjoy features such as Photo Creativity, which lets you preview exposure, white balance, and Picture Effects before you shoot. The 18.2MP Exmor R CMOS sensor captures ultra-high definition images that take full advantage of the camera’s sharp Sony G lens. The sensor enables advanced processing that reduces noise levels, resulting in stunning low light images with incredible details. To improve focusing speed and sensitivity, the Exmor R CMOS sensor uses its rapid throughput to deliver high-quality image signals to the camera’s BIONZ processor. The result is fast, DSLR-like focusing speeds, even in low light. Most digital zooms use electronic cropping to get closer to the subject, resulting in unsharp images. With Clear Image Zoom the powerful processor compares patterns found in adjacent pixels and creates new pixels to match selected patterns, resulting in more realistic, higher-quality images. Clear Image Zoom doubles optical zoom for closer photos. Record crystal clear movies at the highest resolution available with capabilities for 60i in 1080 AVCHD video.1 This provides stunning, fast motion video with less distortion for playback on your HD TV.2 With dual record of stills and movies, you can shoot both at the same time. Capture full 18.2 megapixel resolution images at up to 10 frames per second, helping to ensure that the decisive moment is captured such as the soccer ball flying into the goal. In addition, a mechanical shutter helps reduce distortion when continuously shooting moving subjects. Optical SteadyShot with Active Mode for blur-free movies even while walking.4Camera-shake compensation using Optical SteadyShot/Active Mode has been improved with the addition of new electronic image stabilization.Now it’s easier than ever to obtain sharp, blur-free movies even when zooming in unsteady situations, such as shooting with one hand while walking. Produce awe-inspiring images with 3D still image and 3D Sweep Panorama capabilities.3 Photos will take on a new dimension of creative capabilities for viewing the world in a whole new way. Picture Effect adds a new level of expression to photos, making ordinary landscapes and portraits come to life by heightening mood and emphasizing certain attributes. Select camera models have up to nine different effects. Photo Creativity allows you to fine-tune your exposure settings, such as brightness, color, and vividness, and quickly choose the right enhancement for your subject. Now you can view Picture Effects and Photo Creativity effects in real time on the camera’s monitor or in the viewfinder before shooting. Get cleaner, more dynamic pictures and fewer missed shots. The DSC-HX10V automatically recognizes the correct scene mode, then quickly shoots and combines up to six shots to produce images with greater clarity, optimum dynamic range using backlight correction HDR technology and lower image noise using 6 shots layering technology. Superior Auto intelligently detects 33 scenes for still images and movies, making it easy to get the best shot. Smile Shutter technology captures a smile the moment it happens. Simply press the Smile Shutter button and the camera does the rest. You can also select adult and child priority andindicate the degree of Smile Detection sensitivity. Intelligent Scene Recognition can now be used together with Smile Shutter mode when the Intelligent Auto mode is on. This means that beautiful smiles can be captured with settings optimized for the particular scene, even in difficult conditions such as twilight and backlighting. GPS and compass record location data and camera direction as you shoot movies and photos. GPS Log lets users track a photographic journey and later view the path and images on a map. Map View in “PlayMemories Home” software, allows users to view images on a map showing where they were taken. The logged path and images can also be displayed on Google Earth. It’s frustrating to capture the perfect shot, only to review it later and discover subjects blinked during the photo. The Anti-blink function works to help counter blinking and squinting. When the camera is set to Soft Snap, the Anti-blink function captures two images, recording only the photo with less squinting. If a blink is detected in other shooting modes, a warning will be displayed after you take the shot. Intelligent Scene Recognition (iSCN) Mode automatically detects 33 different types of scenes and, within just 1/30th of a second, selects the appropriate camera settings. iSCN has two modes: Auto and Advanced. In Auto Mode, the camera takes a single shot using the optimal settings. In Advanced Mode, the camera takes a photo with the optimal settings and, if in difficult lighting (low light or back light) immediately takes a second photo with another optimized setting so you can choose which to keep. Conventional point-and-shoot camera flash shots just don't capture colors the way the eye sees them. Natural Flash mode takes a reference shot without flash and then uses that reference to correct the color, for far more lifelike images. In Sweep Multi Angle mode, the DSC-HX10V takes 15 images at different angles as it sweeps across the scene. By tilting the camera during playback, the camera’s Gyro Sensor detects motion and displays the image in a 3D-like view on the camera’s LCD.